One dead on drugs and one dead from driving, but one member of Tipton, Entwistle And Powell is very much alive. 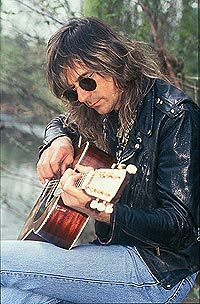 That, of course, would be Judas priest axe-attacker Glenn Tipton, who, because of two sets of tragic circumstances, found himself alive alone in a power trio band concept (Glenn handles all the vocals) that was nixed in its infancy. The sessions have come to light, on Warner/Rhino, who is issuing an 11 track album by the trio called Edge Of The World. Rhino is also reissuing Glenn's Baptizm Of Fire album, on which the Who bass legend and percussion titan figure in minor roles, the album also featuring a couple of bonus tracks. Glenn explains how all this came to pass. "Well, basically, the first batch of songs I did, when Priest were inactive and Rob was doing his own thing... at that point in time, we didn't know if there were going to be any more Priest tours or recordings or anything, and I decided to start writing some material. I approached Cozy, and we looked around and thought for a long time who could play bass, and then we thought of John. John was incredible. There was no doubt in my mind how great a drummer Cozy was, and we spent a lot of time thinking who could be the other members of the band. And John's name came up, and we thought about it, and I always knew he was a great player with The Who, and we shared the same manager, Bill Curbishley and through Bill I contacted John and played him some songs, and he said, 'I'd love to take part.' So we brought him down to a little studio in Wales go called Monmouth Valley, and I just really couldn't believe the talent and versatility that John had. He brought about eight to 12 different basses, eight string basses, 12 string basses, all sorts of things. And he was capable of playing anything; he absolutely floored me. This one track he struck up called Give Blood... me and Cozy looked at each other, and it could have been no other bass player in the world but John. And suddenly we realized we'd got a great blend there, a pretty unique blend. And OK, it was done in '96, but I still think the album has a lot of strength and character, thanks to those two guys."